I’ve loved two things all my life: books and music. Both always served an escape for me during my childhood and that still holds true today. While I attend many music events and many literary events, it is very rare when they ever coincide. 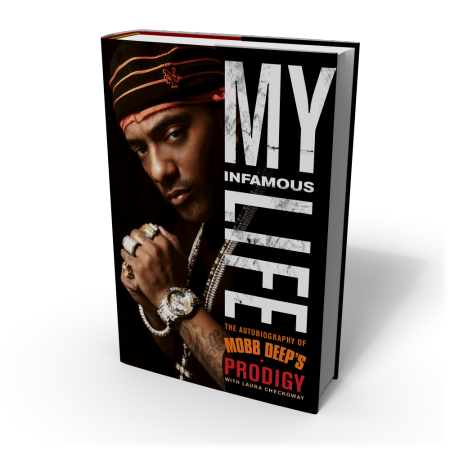 Last night, for the first time they did at the book launch party for famed Queens rapper, Prodigy of Mobb Deep for his autobiographyMy Infamous Life. I really did not know what to expect when I got to Powerhouse books. Normally, when I come to this venue for a book reading it is a small, low-key intimate setting. This was not the case tonight. Instead, it was the Prodigy show complete with cameramen and a reserved seating area. Hip-Hop journalist extraordinaire intervewed Prodigy in front of everyone. Mobb Deep records played in the background while one lone mother read a children’s book to her daughter in corner. Bizzare I tell ya. The night continued and Toure asked a bunch of questions we are already familiar with: his beef with Jay Z, his beef with Nas, how he hooked up with Havoc… all of this I found unimmpressive especially as Prodigy answered PC for everything. What I did find interesting was what I learned about Prodigy as a man. That he had a fondness for his father despite his flaws (heroine use) and how angry he was growing up because of his fight with sickle cell. I also learned that Prodigy was a huge fan of 2 PAC and saw alot of likenesses in him. He also has access to one of Pac’s long lost notebooks which he treasures. I’m standing in line to get my book signed and I am trying to think of something clever to say to P, something that would be like inside joke: only people that are true Mobb fans would get. I wanted to prove I was a fan of Mobb since they came out. Wanted to express how I argued against my colleagues on the radio show that Infamous was a classic album. I mean how could they deny an album that helped put New York on the map and whose language left an imprint on the Hip-Hop culture? And how could an album that Q-Tip produced for not be considered note worthy? I wanted to tell “P” how I scoffed when the man in the audience raised his hand to ask if they have ever worked with Q-Tip. Duh! I knew that, cause I’m a fan. What a waste of a question, I wanted to say and then he’d laugh. There we’d be, sharing a chuckle. But NO, instead I got to the front of the line and completely froze up and said nothing. Oh except when he was nice enough to say” Hey, how’s it going?”. I managed to grunt: “Hey,” back before having to move along for the next cusmtomer. Epic fail. Oh well I guess in the end I don’t need to go around pledging my alliance to Mobb Deep. I’ll read the book in hopes of getting all the non-politically correct answers that weren’t given to Toure and simply because that’s what a true fan does.